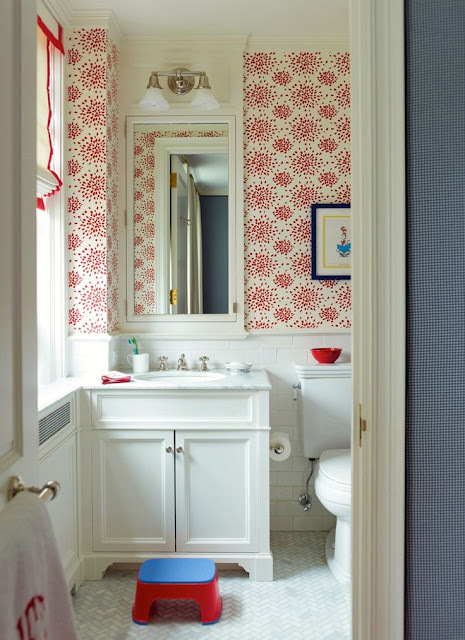 A delightful children's bath sporting Albert Hadley's iconic Fireworks wallpaper and a sweet Dr. Seuss print. Is this Ashely Whittaker? Someone set me straight. I also love the herringbone tile floor and a peek at some lovely monogrammed towels. A perfectly whimsical space for a child that any adult would want for themselves. January is proving to be productive thus far so I'm hoping to keep the momentum going this weekend. You'll find me organizing my house. Probably every weekend until March. Hope your 2016 is off to a good start. See you next week! Simple and elegant. I love the red...such a fun punch of color for a small bath.